Because Taxiles Skipper (Poanes taxiles) butterflies are sexually dimorphic and the males and females have different wing markings, the sexes can easily be distinguished. I observed this male Taxiles Skipper guarding a sunlit patch along the stream in Tucson's Ventana Canyon in June of 2006. Male Taxiles Skippers will defend small courtship territories, usually in unobstructed sunlit openings between the trees where these small, golden orange butterflies can both see and be seen by the browner females. 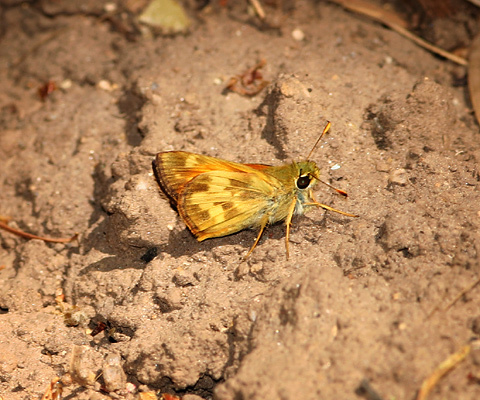 Male Taxiles Skippers have yellow-orange colored wings with brown edges. 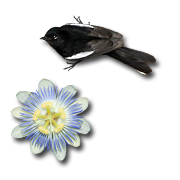 Their ventral hindwings have a distinctive large, yellow arrow shape that points toward the edge of the wing. In the field, Male Peck's Skippers (Polites peckius) are very similar, but they are browner overall, do not have a clear "stem" on their hindwing arrow markings, and the yellow markings on their hindwings have a narrow outline of darker brown which is absent on male Taxiles Skippers. Adult Taxiles Skippers feed on flower nectar, and like other members of the Grass Skippers Subfamily (Hesperiinae), their caterpillars feed on grasses. I'm not sure why these butterflies are called Taxiles Skippers, but there are a couple of historical figures with the Greek name of Taxiles, so perhaps they were named after one of them.